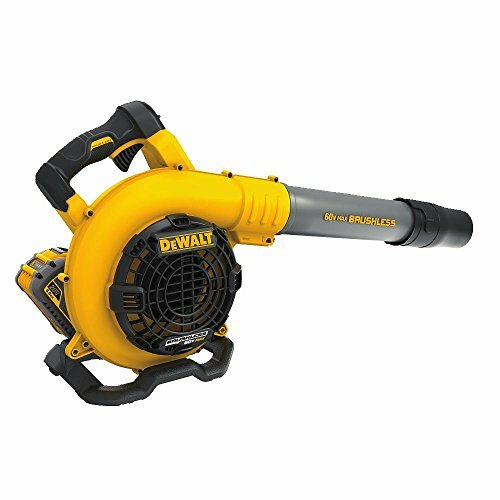 The DEWALT DCBL770X1 60V MAX Handheld Blower with 3.0AH battery is designed to withstand everyday heavy-duty usage. This unit allows you to powers through debris at up to 423 CFM of air volume at 129 MPH. It also has a flat concentrator nozzle which increases air speeds to 175 MPH to power through stubborn debris. The high-efficiency brushless motor maximizes run time and motor life. This blower also features a variable speed trigger and speed lock for total power control. It has a lightweight and ergonomic design which maximizes control and minimizes stress on your arm. Specifications: Air volume (round nozzle) at 423 CFM, Air volume (flat concentrator) at 287 CFM, Air speed (round nozzle) 129 MPH, Air speed (flat concentrator) 175 MPH, Noise Rating at 67.0 dB(A), Weight at only 9.8 lbs. Backed by Dewalt's 3 year limited warranty. Includes: 1) DCB770 Handheld Blower, 1) Concentrator attachment, 1) 60V MAX 3Ah battery, 1) Charger. DeWalt DCBL770X1 60V MAX 3.0 Ah Cordless Handheld Li-Ion XR Brushless Blower New -- Pricing Includes 15% Discount, No Coupon Required! Last updated: April 20, 2019 at 23:26 EST. Pricing information is provided by the listed merchants. GoSale.com is not responsible for the accuracy of pricing information, product information or the images provided. Product prices and availability is subject to change. Any price and availability information displayed on amazon.com or other merchants at the time of purchase will apply to the purchase of the product. As always, be sure to visit the merchant's site to review and verify product information, price, and shipping costs. GoSale.com is not responsible for the content and opinions contained in customer submitted reviews.